Offering you a complete choice of products which include potato peeler and batch type peeler. 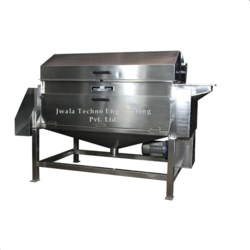 The unit is made completely out of S.S. and is complete with feed and discharge hoppers, water spray arrangement, suitable drive system etc. The vegetables are fed in the drum of the machine. The peeling takes place due to contact of the vegetables with the abrasive material applied on the wall of the drum. The vegetables rotate in the drum due to the rotating disc placed at the bottom of the drum. Water is sprayed in the drum during peeling operation. With the help of timer the peeling time can be set. After the set time the peeling stops and the vegetables are discharged from the hopper. Top lid, water and waste discharge pipe etc.